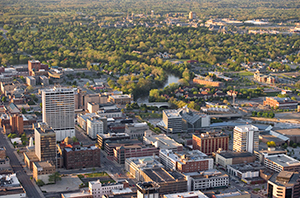 Announced at White House Smart Cities Forum on Monday (Sept. 14), the University of Notre Dame is joining in a partnership with the City of South Bend to bring together University researchers with city officials to address critical community needs. The Notre Dame and South Bend partnership is one of more than 20 such alliances around the country. The agreement, called the MetroLab Network, is a national consortium of university-city partnerships committed to developing ways to improve infrastructure, city services and other public sector priorities using technology and analytically based solutions. MetroLab Network is a part of the Smart Cities Initiative, the White House administration’s focus to create smarter cities through science, technology and civic participation. The announcement was part of a gathering of university and city leaders from around the country held Monday in Washington, D.C.
“Notre Dame and South Bend will work closely together to address some of the city’s most pressing issues. Using the latest innovations in technology, Notre Dame researchers, faculty and students will develop solutions that positively impact our community,” said David Murphy, associate dean of entrepreneurship for the Colleges of Engineering and Science and director of the ESTEEM Graduate Program in Entrepreneurship. Murphy has been appointed by University leadership to lead Notre Dame’s commitment to the MetroLab Network. Murphy also noted that a key element to the MetroLab Network is scalability. “One of the interesting aspects of this Network is being able to share our efforts here in South Bend with other communities around the country. We also expect to learn a great deal from colleagues working on projects in other cities which may apply to the needs of our own community." To enable university-city partnerships to share their projects to ensure broad dissemination and adoption, including the development and sharing of the infrastructural tools required to support scaling promising solutions and deploying best practices across the network. To enable the university-city partnerships to identify common problems that can best be addressed through multi-city, multi-university approaches. To provide a platform for members to collaboratively plan and seek funding resources to support multi-city projects, focused on piloting solutions in multiple locations to validate and understand what works under what conditions. City administrators will identify problems that University research and/or educational projects might address, and in turn, Notre Dame will also identify research and/or educational projects that might respond to issues within the city. Bowman Creek Project: Create a test bed for the development of “Internet of things” applications and the relationship between these systems and people, starting with environmental applications. Neighborhood Report Card: Use advanced mathematical modeling to assess the effectiveness of the service portfolio of the city and suggest optimal improvements for services. Community-Based Research: Enhance the relationship between residents and data; improve the ability of students and residents to produce and analyze city data. Wireless Institute: Develop an understanding of the modern environment for urban wireless users; create a test bed/framework to test the next generation of wireless technologies for urban environments. Originally published by Sue Lister at news.nd.edu on September 14, 2015.